^ M. W. Johnson, et al. (2011). “Quantum annealing with manufactured spins”. Nature 473: 194–198. doi:10.1038/nature10012. ^ R. Harris et al. (2009). “Compound Josephson-junction coupler for flux qubits with minimal crosstalk”. Phys. Rev. B 80: 052506. doi:10.1103/PhysRevB.80.052506. http://arxiv.org/abs/0904.3784. ^ M. W. Johnson et al. (2010). “A scalable control system for a superconducting adiabatic quantum optimization processor”. Supercond. Sci. Technol. 23: 065004. doi:10.1088/0953-2048/23/6/065004. http://arxiv.org/abs/0907.3757. ^ R. Harris et al. (2010). “Experimental demonstration of a robust and scalable flux qubit”. Phys. Rev. B 81: 134510. doi:10.1103/PhysRevB.81.134510. http://arxiv.org/abs/0909.4321. ^ Edward Farhi et al. (2001). “A Quantum Adiabatic Evolution Algorithm Applied to Random Instances of an NP-Complete Problem”. Science 92 (5516): 472-475. doi:10.1126/science.1057726. ^ a b c 西森秀稔 (2014). “量子アニーリングとD-Wave”. 情報処理学会論文誌 (Information Processing Society of Japan) 55: 3. ^ Kaminsky; William M. Kaminsky and Seth Lloyd (2002-11-23). “Scalable Architecture for Adiabatic Quantum Computing of NP-Hard Problems” (PDF). Quantum Computing & Quantum Bits in Mesoscopic Systems (Kluwer Academic. arXiv:quant-ph/0211152. ^ Meglicki, Zdzislaw (2008). Quantum Computing Without Magic: Devices. MIT Press. pp. 390–391. ISBN 0-262-13506-X. 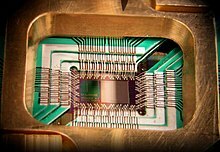 ^ Quantum annealing with more than one hundred qubits. Cornell University Library. (16 4 2013). http://arxiv.org/abs/1304.4595. ^ Wim van Dam (2007). “Quantum computing: In the 'death zone'?”. Nature Physics 3: 220 - 221. doi:10.1038/nphys585. 西森秀稔 (2014). "量子アニーリングとD-Wave". 情報処理学会論文誌 (Information Processing Society of Japan) 55: 3.